In the automotive enthusiast world, there is a joke that "Miata is always the answer." 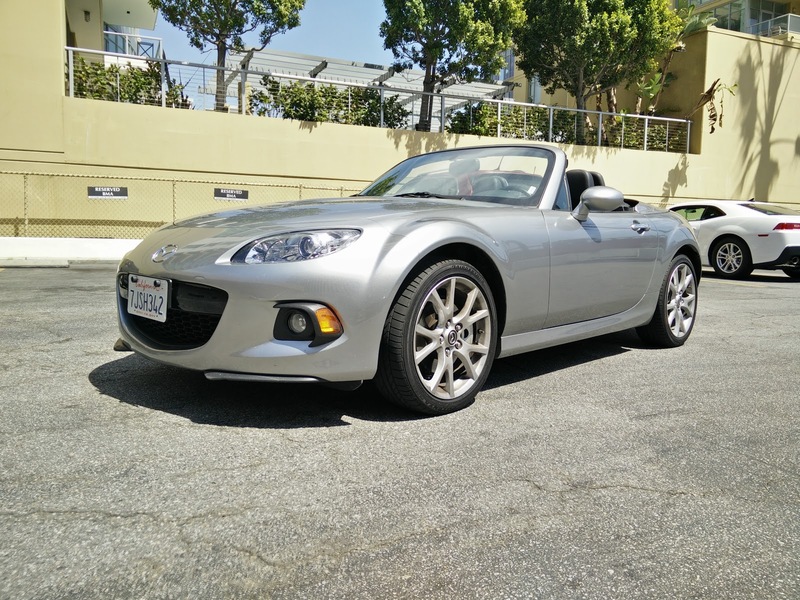 It is one of those things that is usually spoken half jokingly and half seriously because the Miata is truly one of those gems of a car that is capable of so much and is one of the rawest driving experiences that we can get at an affordable price. As a former Miata owner, I have a serious love affair with how the little roadster drives. The NB generation 10th Anniversary Edition that was our only car for nearly a three year period was absolutely one of the funnest cars to own and I had many an adventure in that car because of how easy and fun it was to drive. Unfortunately, the confluence of a pricey repair and a pending relocation to a much snowier climate forced our hand and we ended up parting ways with the beloved roadster in the summer before we moved to Boston. I continue to miss that car dearly so when someone rear-ended our Focus Electric and the car needed to be in the shop for a week, the other party's insurance company offered to pay for a rental car for the duration of the repair. While I was at the rental car office, examining their available stock, the presence of an NC generation Miata with the power retractable hard top (PRHT) was rather conspicuously catching my attention. A bit of prodding around at the other cars available and some shrewd negotiation later, I was seated in the Miata and dropping the top. The latest generation of the Chevrolet Camaro has been one of those cars that, to me at least, looks pretty interesting, but I have never felt the urge to drive. 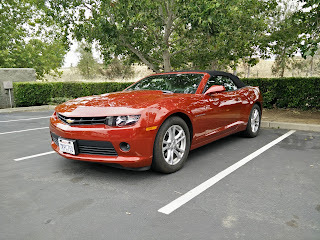 While planning a trip to visit some friends and their toddler in Northern California, I stumbled upon a rental car deal using my AAA membership that was too good to pass up. When I left the Enterprise desk at the airport, I ended up driving off with a bright red, 2015 Chevrolet Camaro V6 convertible...for $35 a day. Considering that it was only a mere $3 more per day than whatever crappy sub-compact car I was originally going to get, I definitely call this a worthy upgrade. It had been a little while since I had gotten much seat time in the Sonata, so a quick jaunt up the Express Lane into the heart of downtown LA gave me a chance to reacquaint myself with the car. On the freeway, the car remains a smooth and steady cruiser with a great ride even on the notoriously uneven and grooved concrete that makes up much of the 110 Express Lane. The issue of the squeaking sunroof had been addressed and the car sounded more solid once again. Speaking of sound, I must admit that I am not a huge fan of the Infinity audio system that is in our long-term car. There is plenty of bass and if you are listening to lower quality recordings it is wholly adequate. However, even after plenty of fiddling around with the settings, the higher frequencies continue to sound slightly muddled and lack a crispness needed to cut through the overpowering bass notes. It probably does not help that the sound stage provided by the Sonata's cabin is hardly ideal given how much road and wind noise manage to seep in. It is certainly one of the noisier cabins I can remember being in, especially since it is nearly impossible to have a conversation with another passenger without needing to raise your voice at least a decibel or two. As far as fuel economy goes, I will continue to belabor the point that I am wholly disappointed with the Sonata's thirst for fuel. It obviously does not help that where the car is housed is one of the hillier areas of Southern California, but just how far below the EPA ratings the car is performing is almost embarrassing. Right now, a romp to just about anywhere and back nets an average fuel economy somewhere around the high teens. That is around what our long-term MDX is turning in and that is a three-row SUV with a serious weight penalty on the Sonata. Worst of all, even when driven as smoothly as possible with near constant and vigilant use of the cruise control, I have yet to turn in a run that managed to top 30 mpg at any point. Staying out of the boost is not hard to do, but even driving it in full Eco mode and channeling the patience of Gandhi, I never even manage to get close to the EPA ratings. Heck, I am barely able to match the EPA numbers going down a hill. I am not sure if this is a problem with our specific car or if the problem is this bad across the board, but I certainly hope this is something that Hyundai has spent a lot of time and effort addressing in the latest version of the car. I have a love of wagons, but automakers seem to feel that bringing their wagons to the US is a waste of time and money. Who can blame them? Americans simply do not buy wagons or hatchbacks in the same kinds of numbers as our European counterparts. Instead, my fellow Americans are obsessed with SUVs and crossovers. So what is an enterprising, profit driven automaker to do when its parent company has a crossover that is ripe for the picking? Why, you add another vehicle to your line-up, of course. This is precisely what Porsche has done with the all new Porsche Macan. 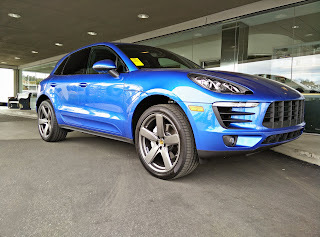 Just as the larger Cayenne is based on the same platform as Audi's Q7, the Macan shares its platform with Audi's Q5. This makes for a relatively compact CUV that still offers decent cargo space. Thankfully, Porsche has injected a bit of flair into the design, making the Macan look similar to its big brother and definitely carrying the family's now signature nose. By now, most people have already heard of the massive airbag recall issued by the NHTSA. If you have not, here are some basics that you need to know. Late last year, Honda had issued a massive recall regarding its airbags installed in early and mid 2000 Honda and Acura branded vehicles. A defect in the inflator and propellant devices may deploy incorrectly during a crash and cause metal fragments to shoot out at occupants. Honda's airbag supplier is the Japanese corporation, Takata, which is well known for its seat belts, steering wheels, and other interior trim and safety pieces. Enthusiasts recognize the Takata name for their racing harnesses and other race car safety equipment. What was originally thought to be just a Honda issue soon bled over to Toyota, whose airbags were also supplied by the Takata Corporation. As it turned out though, Honda and Toyota were not the only companies sourcing their airbag and airbag components from Takata. To date, a total of 16 manufacturers are now affected by the recall. For a full list of manufacturers, as well as which vehicles are affected, you can visit the link below, which is supplied by Car and Driver magazine. The above link also provides links to identify whether or not your own vehicle is one of the affected makes and models in the recall. Car and Driver is also continually updating the page with the latest updates regarding the recall. So what does this mean for you? Odds are, if you are driving a pre-2000 era vehicle or a very recently built vehicle, you are most likely safe. If you are unsure, it does not hurt to consult with your dealer or the manufacturer itself. However, if your vehicle is on the affected list, you should have already received a notice from your vehicle's manufacturer to take your car to the nearest dealership to have the airbag replaced with a non-defective unit. If such a letter or notice has not yet been received, your local dealer can look up your vehicle's info using its vehicle identification number (VIN) to determine if your vehicle is on the affected vehicles list. For the most part, the actual ownership experience of an EV has really been only minimally different from owning a regular gasoline powered car, aside from being able to wryly smile at the thought of not needing to stop at the local gas station ever. The Focus has proven itself actually quite capable in just about all capacities we have tried to use it. In the last six months, we have moved to a new home, which necessitated many trips back and forth between two locations and occasional stops at our storage unit. Even with a lack of fast charging immediately at either location and the rather high speeds typical of Southern California freeways, we often were able to get several trips out of the battery with only a bit of topping off when stopped at each location to unload. 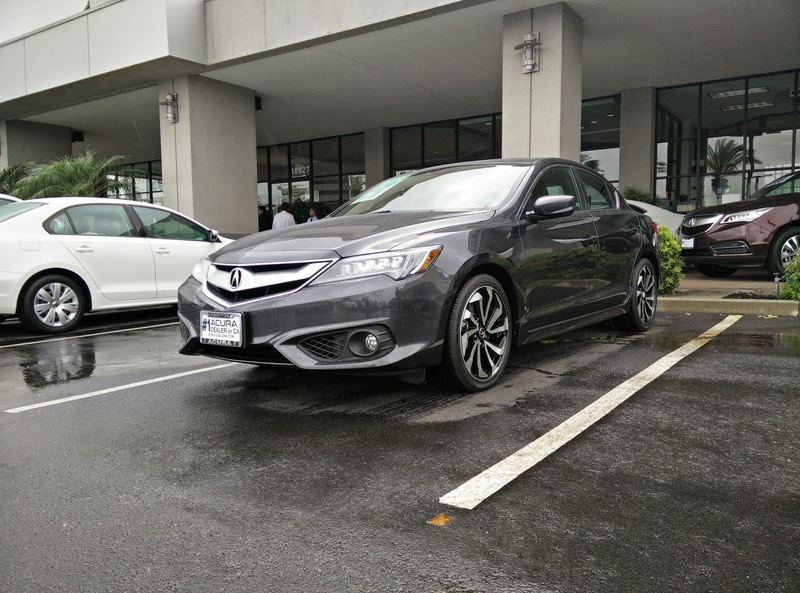 A key part of the car's versatility is the hatchback body style, which time and time again has proven to be invaluable, despite the presence of the massive battery hump. 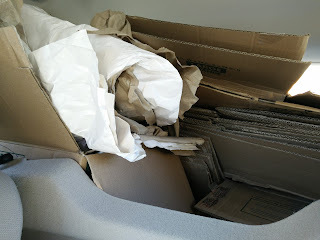 Following our move, we had a ton of nearly destroyed cardboard boxes and some other random junk that needed to go to the local recycler, so we dropped the back seats and filled the car full of stuff to haul away. Need to carry a pair of bicycles? Not a problem. Remove the front wheels and both bikes fit in with room to spare. With a little bit of skill, you could probably squeeze a third bike in there as well. What about a dog? Our newly adopted Lab mix has plenty of room in the back to move around, though when she stands, the view out of the rear is pretty much non-existent. Still, it is an extremely versatile car that for commuting and around town use has been perfect. Of course, it has not been entirely problem free. Imagine my surprise when I arrived home on Saturday after hanging out with West Brother to find that the streets right around my home closed off to traffic. There was a vague inkling of local retailers and restaurateurs mentioning that there was some event going on over the weekend, but no one had clearly indicated what that event was. And of course, the last few weeks had been so busy, I had not paid that much attention to the little posters popping up in the shop windows. Once I managed to make my way back to my parking space, it was time to go explore and find out what was going on. As it would turn out, going on literally steps from my front door was the Long Beach Bike Fest, a celebration of all things two wheeled with vendors hawking their wares, local advocacy groups recruiting for members, and, of course, the obligatory biergarten to satisfy the thirst of the throngs of local cyclists who had come to attend. What was not expected, however, was the presence of a closed course race track on public streets. As a part of the Bike Fest, a square track had been cordoned off for the Wolfpack Hustle Short Line Criterium race. The race was open registration, meaning just about anyone with a bike that could pass inspection, could register to participate in any of the 4 races.